The West Montrose Covered Bridge was built in 1881 and is recognized as a historic site by Ontario's Archeological & Historic Sites Board. 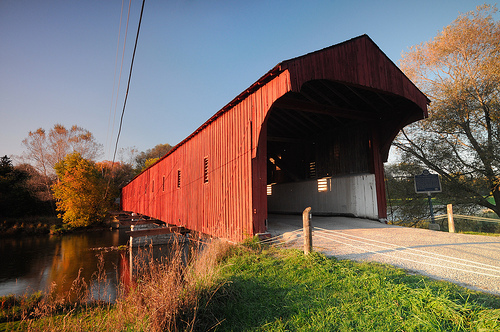 It is Ontario's last remaining covered bridge and has a 198' span across the Grand River. Visitors come from all over the world to see, walk across, and photograph this picturesque and unique bridge. The roof over the bridge protects the large timbers and trusses from the elements; this is also the reason the bridge is still standing after more than 100 years. Uncovered wooden bridges typically have a life span of only 10 to 15 years - exposure to rain causes unprotected joints to rot in summer and freeze in the winter, and the hot sun causes the wooden planks to dry and curl. The bridge underwent major repairs in 1999. Light traffic still crosses the bridge daily, including horses and buggies. Horses typically fear rushing water and often become spooked as they approach bridges. However, a horse will trot up to the opening of a covered bridge and clip-clop through, reassured by the side walls and the light at the end of the tunnel. The bridge is often referred to as "The Kissing Bridge" because it is enclosed and the soft light provides a feeling of intimacy for the romantic. The structure can still be used by pedestrians, buggy traffic and vehicles weighing less than three tonnes for crossing the river. Since 1998, it has been owned and maintained by the Regional Municipality of Waterloo.